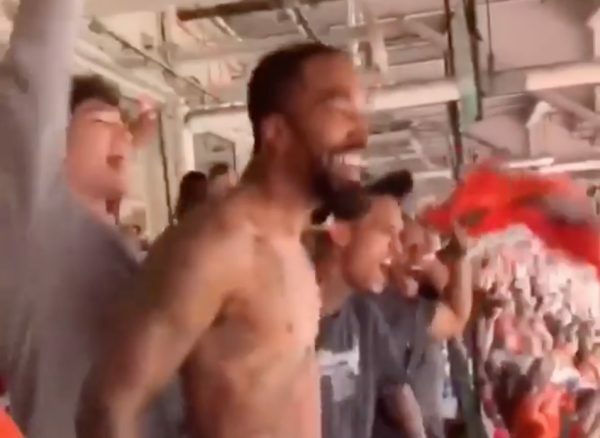 Shirtless J.R. Smith is back. After the Cleveland Browns’ 12-9 victory over the Baltimore Ravens on Sunday afternoon, Smith was seen on video celebrating without his shirt on. Smith’s celebration came right after Browns rookie kicker Greg Joseph hit the game-winning 37-yard field goal in overtime. Also seen in the video are other Cleveland Cavaliers players such as Cedi Osman and Jordan Clarkson. To see them all go on team outings like this bodes well for the development of team camaraderie and chemistry. As Smith is the oldest Cavs player out of the three, he seems to be continuing LeBron James‘ tradition of taking teammates out to football and baseball games. It has now become difficult to count the number of times that Smith has been seen celebrating in public without a shirt, but it has certainly become a huge internet sensation ever since his first major shirtless appearance in the aftermath of the Cavs’ NBA championship victory in 2016.